The Peanuts are known all around the globe. But there are still some people who don’t know who the Peanuts are. Could you tell them a little bit about them? Bob: Actually, they’re children and not peanuts, so you can’t eat them! Vicki: Well, in 1950 Charles Schulz sat down and invented a group of children who live in the same neighborhood. Charlie Brown is the main guy, I think. Then there is his dog Snoopy and Snoopy’s friend Woodstock. Those are the easiest to get to know. Yes, those are the ones I think everyone knows. Vicki: Yes, and interestingly each one of them was kind of a part of Charles Schulz himself. The failed Baseball player, the artist … all of the characters have a little bit of himself. Maybe that’s the reason they resonate with me, too. And they are not just plain funny, but there is a real depth to the stories and the characters, as well. The last part might be the reason why grown-ups are so drawn to them, too. Vicki: I think kids read them and don’t understand everything in the comic books. Once I was in a movie and you knew which gags were more for the grown-ups, because then the laughter was deeper than when the children started to laugh. Bob: Yes. 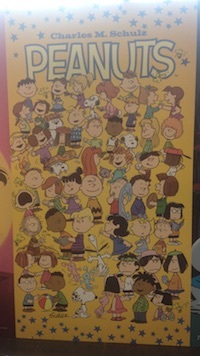 In the animated versions the children love the more physical humor with Snoopy and Woodstock, and Charlie Brown’s angst and depression are resonating more with the adults. As a child for example I couldn’t understand why Charlie Brown was depressed at christmas time. But now as an adult I get it! I think the physical humor you refer to is also in the comic album that takes place in Tokyo. There is this little scene where Snoopy and Woodstock are eating noodles. Bob: Yes, exactly. This is a scene that is more like an animation because there are no dialogues in there. Vicki, you’ve never been to Tokyo before you drew that. Bob: (laughs) Well, she had hoped that this book might get her there. (laughs) Seems it didn’t work out. Are there any cities or landscapes or such that you would like to portrait in a comic book? Bob: Okay, we got to come to Germany, so it worked out in a certain way! So the next comic book will have pretzels in it? I read that you are working with a creative group for the stories. How does that work? 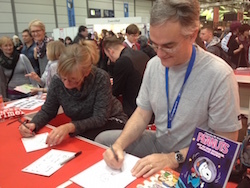 Most of the time the comic books are made by one person, they have an idea, they write it down and then they make the drawings or find someone to do it for them. Vicki: This team is essential for this property because it is not ours. By double-checking it with other people we are making sure that we’re not making it too much ours and drifting away from Charles Schulz’s work. We really want to echo what he did and not make it ours. So the team really helps us keep it in track. 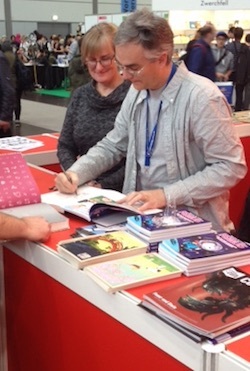 Many wanted to have their books signed. Vicki: They’re also easy to get along with and we like each other’s work. We’re not yelling at each other. They’re all very nice and polite. Bob: The people who work for Creative Associates which is the company that Charles Schulz started are all people who grew up with the characters and know them very well. They love them. They all know different aspects of the characters, so it’s great! They all check that no one gets off-track and everything stays in the right universe. Vicki: Or, heaven forbid, I got Peppermint Patty on the wrong team at first and then I had to figure out a way to get her on the right one again. Bob: Alex Galer is the editor and he is like a living encyclopedia of all the things and characters. At some point you’re bound to miss something and then he comes and points out the mistake. How do you decide what the next theme will be for the next comic book? Is it a group decision like: Well, I think next we’re going to go to Tokyo? Vicki: I just wrote it and hoped that they would go along with it. Vicki: And they said yes. Bob: Well, Page Braddock, the Creative Director at Creative Associates, knows the family of Charles Schulz very well and she knows what they would like to do. When Vicki wrote this she liked it immediately and made sure that the family was on board with it. Vicki: … It sounds so nice. Bob: Charles Schulz always wanted to do a Scotland-story. No chance of doing some Baseball there for Charlie Brown. Vicki: Yes, Golf! And I hope bagpipe-playing. 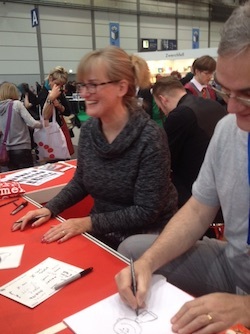 The signings were a lot of fun. How did you come to work for the Peanuts? Bob: I am a long-time animator and have been working for a long time in the industry. I have been working at Pixar for almost 12 years, and Andy Beall who is now back on the team there had left and was working on some stuff for the animated Peanuts. He did this special called „Happiness is a warm blanket“ which was traditionally animated. Page and Andy thought it would be nice to have a graphic novel to go with it. Andy called me at my work and asked if I wanted to do it as a freelance-job and since it was a really big project with 80 pages or so, I asked if I could do it with my wife. We split the work and since it was so much fun to do it, we stayed on. Vicki: That was 2010. We’re still kinda new to it since the Peanuts are there for almost 50 years now. Bob: It was bringing back the comic books which was an idea of the 50’s and 60’s in Charles Schulz’ lifetime. Then they published a series at Dell Comics and they were drawn by other artists while Schulz oversaw them. The artists worked closely with him to learn the characters. Schulz was fine with other artists working on the characters so more came on board. Then came the merchandising, and he needed to focus on his strips while other people did the rest. So we really brought that tradition back. Schulz allowed it then and we just brought it back. How do you explain the on-going fascination for the Peanuts? Vicki: Yes, it’s been rather long running. I heard a child psychologist say that it is a great place for kids to come into contact with their feelings of failure, of loneliness – those feelings from the other side of the scale. Maybe that is part of it. I think it has a lot to do with Snoopy. Bob: (laughs) Yeah, I think Snoopy’s imagination and his comedy is so physical. He is less a dog and more of an artist who can imagine this fantastic world, and people can relate to that. As a kid you can use a carton and pretend it’s a spaceship. Snoopy does all that all the time. And what is your personal fascination? Vicki: I’ve read them since the time I could read. So they’re like family to me. That’s it for me. I love them as a kind of family. Bob: Yes, I love what Charles Schulz did and he was one of the greatest artists of all time. Bob: Yeah, definitely. He inspired so many people. Comic books like „Calvin and Hobbes“ were influenced by him – many of the snowmen-gags were inspired directly from Schulz. People forget sometimes how great he was since he is such an integral part and such an institution in the genre. He was the first to bring children on the scene who talked like adults. Linus and his blanket for example. Many children carry a blanket with them for security-reasons. But no one ever thought of bringing that into a cartoon before Charles Schulz. Great stuff like that is the reason why I am still fascinated by his work. Are there any other inspirations for you? Vicki: I like Mary Blair a lot. I love modern art, but I also love Jane Austen. So it’s less comic books than you might expect. I think you get the inspiration everywhere, so it doesn’t matter if it’s from written work or drawn pages that you get your ideas from. Bob: I loved the comic strip Pogo by Walt Kelly and the work of Hank Ketcham (annot. : most famous for his „Dennis the Menace“-comic strips). I think Hank Ketcham is the best cartoonist in the world next to Charles Schulz! Would you like to say some closing words? Bob: Well, we love animation and comics. Vicki: It was such fun to draw the characters and to work with the characters. Although I never met Charles Schulz, I still have the feeling that he’s looking over our shoulders. Bob: We respect his work and want him to be proud of our work. The fans were worried when it was announced that we were publishing a new comic book. They worried that we might modernize it, but there is still no internet and no mobile phone. Vicki: The Peanuts never moved forward in time. Bob: So the fans could just enjoy the reading and remember that time when there was no computer. Ah, yes, when the children went out and played outside and didn’t sit in front of the computer. You go and play Baseball with your friends like Charlie Brown. So there is still more of the Peanuts in the future for you? Thank you very much for this great interview! It was a pleasure and much fun!